Zabrachia polita Coquillet (figs. 41, 42): Zabrachia (2.4-2.6 mm) has a round cell in the middle of the wing (fig. 41A). The antennae have three segments with an apical arista. 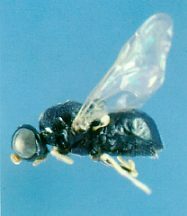 The body is black with a tiny, pointed abdomen. The thorax has no long spines and the eyes are large and gold. 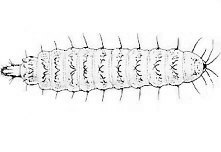 The larva (fig. 41B) has armored skin and many long bristles.